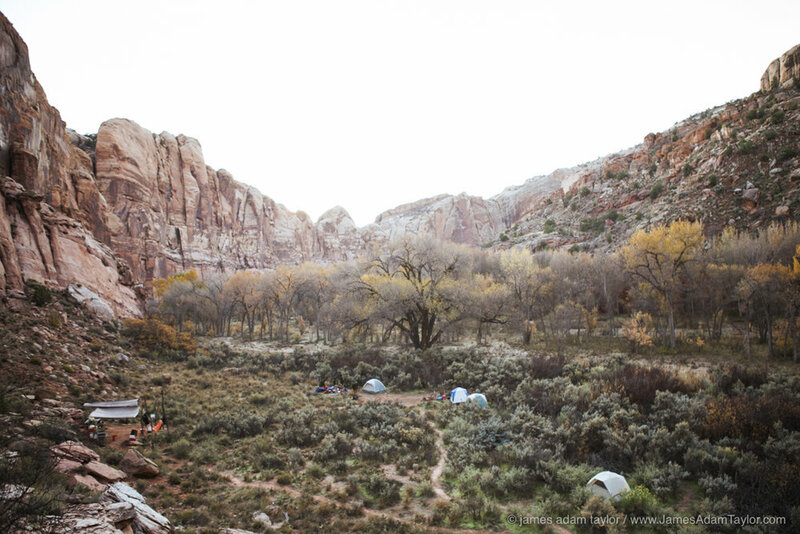 In October I met with Utah Conservation Corps' Boulder B Crew at the Phipps Wash Camp along Boulder Creek in the Escalante National Monument. The crew was working on a long term project aimed at eliminating the invasive Russian Olive tree from the banks of waterways throughout the monument, as seen below. Morning over Phipps camp, along Boulder Creek. JP Smith offering a view into a container of bar oil. After earlier attempts to fill a reservoir failed it became apparent that there was an obstruction inside. Further exploration turned up a dead mouse. The crew uses biodegradable vegetable based bar oil to avoid polluting the delicate ecosystem. Occasionally mice will chew through lids in an attempt to consume the oil, sometimes it's their last meal. 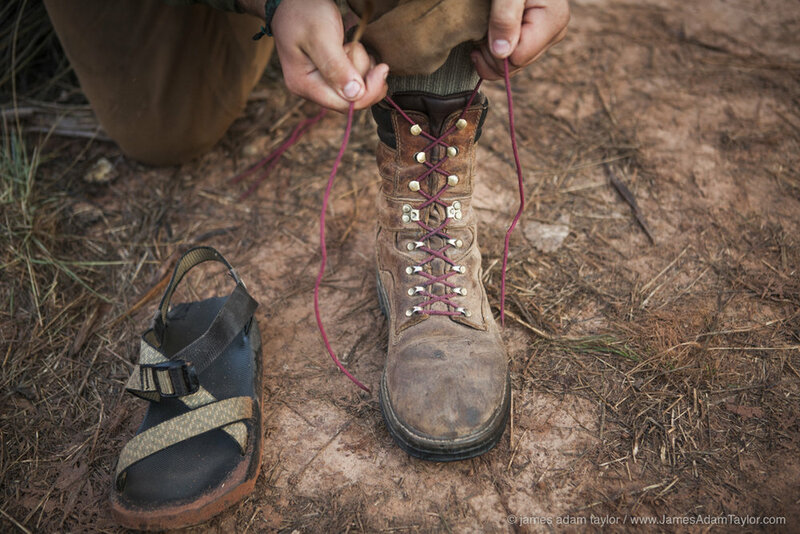 Crew Leader James Shaw laces his boots in preparation for the day. Members of the Boulder B crew cross Boulder Creek on their way to the morning work site. 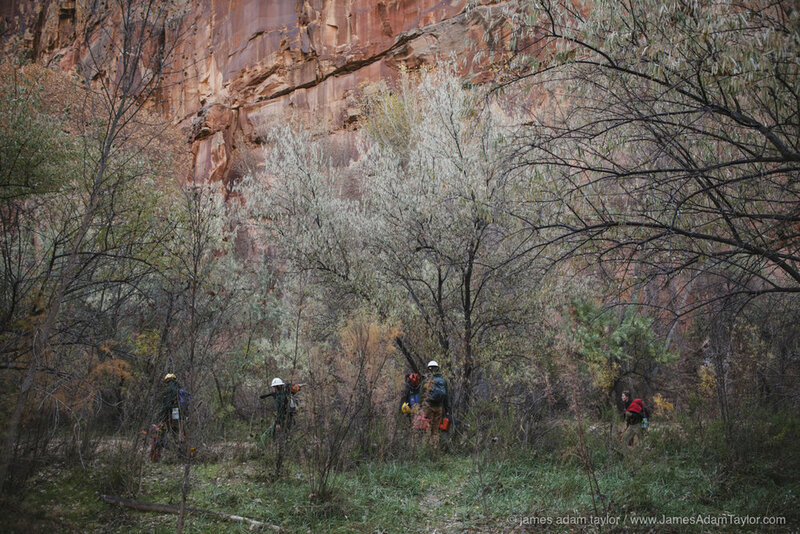 On the way to the days worksite, the Boulder B crew passes through a thicket of Russian Olive which were girdled the day before. Trees are Girdled by sawing through the bark around the base of the tree, herbicide is then applied to the exposed cambium layer. This effectively kills the tree and prevents re-sprouting but allows the biomass to stay in place. This provides habitat to birds and other animals while native plants fill in around it. Sophia Knaphus low stumps a fallen Russian Olive while JP Smith waits to apply herbicide. Herbicide is applied intentionally only to the cambium layer around the outer edge of the stump, this will prevent re-sprouting and kill the roots. Upstream of the Boulder B crew worksite, Russian Olive is encroaching on a meadow. 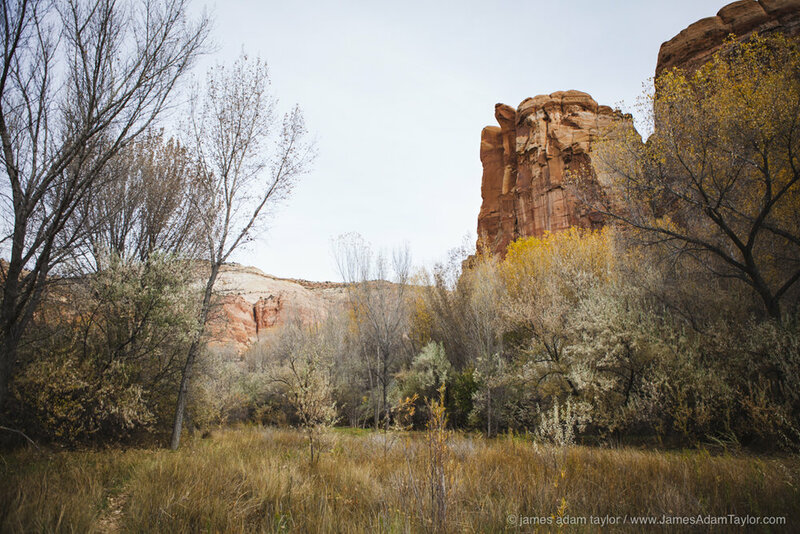 Around the periphery tall Cottonwoods are mostly bare while a few still cling to their yellow autumn leaves. Upstream in an area worked by another crew, another removal procedure is apparent. Here further from water, trees are cut into smaller pieces and placed into "Habitat Piles." These piles will serve as hiding places for rodents and other canyon residents. Some piles will wash away in flash floods while others may remain as biomass supporting future generations of plant and animal life. 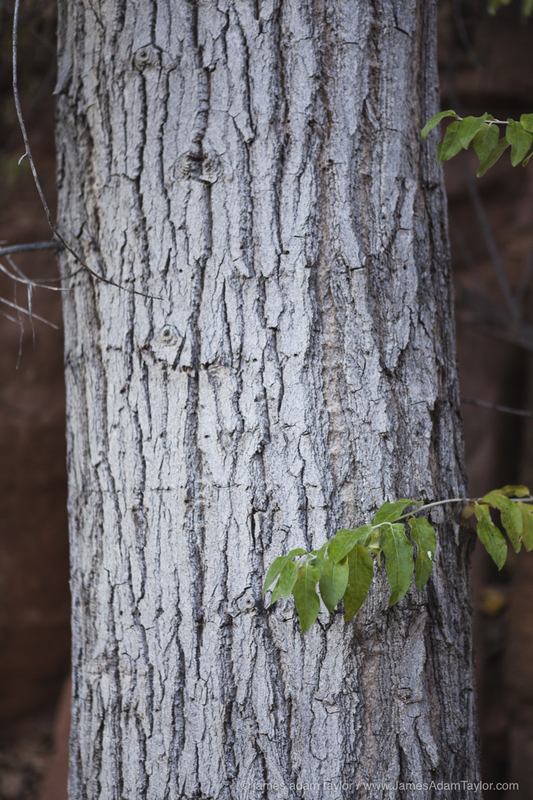 The Russian Olive is a hearty tree that can thrive in many soil types and is highly drought tolerant. It has striking silvery leaves and a unique dark furrowed bark. It grows quickly and can become very thick and bushy. For these reasons, it has had a history of introduction to areas outside of it's native range of Central Asia. In parts of Europe and in the Northeastern United States it has had a long history of ornamental planting, but cold winters and other factors have kept it from spreading uncontrollably. In the American Southwest however, it's introduction as an ornamental, a hearty windbreak, and as habitat expansion for pheasant gave it a strong start in a harsh environment for which it was more than capable of overrunning and out-competing native species. Dark Furrowed bark of the invasive Russian Olive. After four miles of hiking, I met with the Boulder B Crew as they were finishing up their after dinner tasks of refilling water jugs, cleaning dishes, and preparing for the following day. Crew leaders James Shaw and Joe Klingelhutz welcomed me to camp and explained the scope of the project. Crew member Nolan Crees pointed me to an open space to pitch my tent, and members Sophia Knaphus and JP Smith helped me refill my water bottle from the crews bucket filtration system. After we finished introductions, everyone withdrew to their tents for the night. As the sun rose the following morning, the sagebrush, small cacti and grasses were wet with dew. It was a cool morning, and breath formed white clouds as it left airways. I met the crew as they finished breakfast, stretched, and began equipment preparations for the day. Boulder B Crew member Sophia Knaphus carrying fuel and bar oil to the days work site. Joseph Klingelhutz, Sophia Knaphus, Lauren Breitling, JP Smith, James Shaw, and Nolan Crees. 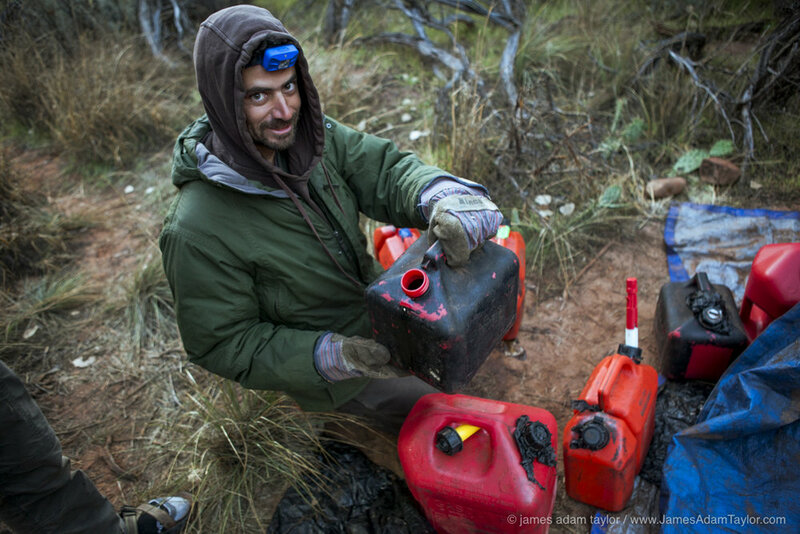 They checked chainsaw bars and chains, refilling reservoirs with fuel and bar oil, packed bags with lunch and additional tools. After prep they started off to a project area a short distance upstream. Today under new directions their focus would be to shift efforts to areas directly adjacent the river banks. Pushing through thick silvery leaves and branches, members knocked lower limbs from trunks before starting chainsaws to make initial cuts. Boulder B Crew leader, James Shaw sharpening chainsaw teeth along the bank of Boulder Creek. The elimination procedure seemed simple enough; fall the tree, buck the branches and limbs into segments of 8 feet or less, and allow those to flow downstream where they would be "chewed up," in a narrow section of rapids before making their way to a final resting place somewhere downstream. 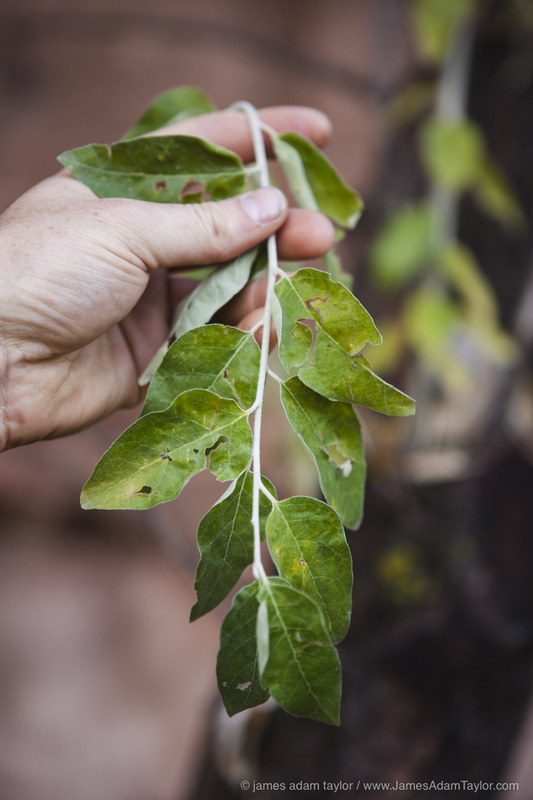 After the bulk of the tree was gone, the remaining portion would be cut to ground level or “low stumped,” and an herbicide would be applied to the cambium tissue between the bark and wood to prevent the tree from regrowing from the remaining roots. Unfortunately for the crew, much time was spent on chainsaw maintenance because of the fine sandy soil. Regular flooding in the canyon coats most surfaces with fine sand to a height of two or more feet. This alone is enough to dull the teeth on the chainsaw and create excess friction which causes the chain to heat, stretch, and eventually throw. But with the process of low stumping, it’s inevitable for ground contact to occur. Dirt gets sucked up into the saw and the whole bar, chain, and other portions were in a constant state of removal, cleaning, sharpening, adjusting, and waiting to cool. The crew kept their heads up and proceeded with hand tools when multiple saws were being maintained. Despite constant maintenance, progress was apparent. Pushing forward along the creek was like moving through a wall, but one look behind exemplified the work. What had once been a tightly overgrown area filled with a dominant invader was again open and ready for native Cottonwood, Willow and others to fill in the gaps. In the coming years, the project will change to one of maintenance rather than removal. Future crews will work their way through to eliminate new growth and passed over remnants. In the coming decades, the habitats will continue to recover, resulting in healthier ecosystems for native species. Eventually, areas open to grazing will have higher yield benefiting the communities that rely on the resources. A big thanks to the UCC members JP Smith, Lauren Breitling, James Shaw, Sophia Knaphus, Joseph Klingelhutz, and Nolan Crees for bringing me into their project and their support of our Public Lands. I would also like to thank Liz Sodja of UCC for facilitating my visit to the Boulder B. Crew.